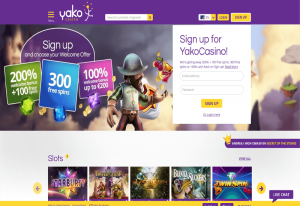 Yako Casino has been launched in August 2015 and it holds a license from the Malta gaming authority. The mission behind the Yako Casino is to breathe new life, color and fun into the world of virtual casino entertainment. The purple and yellow design theme inspires indeed all the aspirations of the creators. The fresh and bright feeling of these two colors is also kind to the eyes. The motto of the casino is “Have it your way”. This is stated also in the name of the casino, which in Swahili language means “yours.” The monogram of the casino depicts a funny character with a golden crown that also appears as loading icon. Being based in Malta means that the winning you will make at this casino are free from taxation. The creators of Yako casino have extended experience in the gambling industry. The design is intuitive, thus making it easy for players to navigate around it to find games. The games can be found using the search field or in groupings or categories in what they call the casino lobby. These games include Slot, live casino, table games, jackpots, virtual sports and more. Yako Casino offers games from N etEnt, Play’n Go and Leander Games. Players can enjoy some of the world famous progressive slots such as Mega Fortune and Halls of Gods together with the video slots: Megadeth, Little Pigs Strike Back, Dead or Alive, Dazzle and Spin Party. The players that enjoy the old school three reel slots have the chance to find some in the game library. Table games are represented with different roulette variations such as French roulette and roulette pro, or blackjack variations like single deck blackjack, double exposure blackjack and others. This section includes punto bianco, red dog, pai gow, oasis Poker, hold’em and many more. Live casino enthusiasts can play live broadcasts of blackjack, roulette, hold’em and baccarat in which a real croupier throws the dices, spins the wheel or deals the cards. The welcome bonus is 100% up to €222 or $333 and 222 free spins at Starburst. The 222 number is chosen carefully; it represents a new beginning in the ancient numerology. In addition, clients that only register receive 10 free spins for Starburst. In order to receive the bonus, you have to deposit a minimum of €20 or $30. The wagering requirements are 25 x for the bonus and the winnings generated by the bonus. The maximum bet you can place for a wager is $5 or equivalent in any currency. The bonus is available only to players from Finland, Norway, Sweden, Netherlands, Australia, New Zealand, Canada, Germany, Belgium, Switzerland, Ireland and Austria. Free spins are valid for three days and have to be wagered 35 times. Once the wagering requirements are met, the winnings can be withdrawn. Yako has an offer for the ones that prefer to start with a big deposit bonus. It is 300% up to €150, with 50 free spins. The games at the casino can be played from smartphones or tablet devices. The majority of games from NetEnt and Microgaming are designed for both desktop and mobile usage. Deposits and withdrawals are made possible via bank transfer, Visa, Maestro, MasterCard, Neteller, PaysafeCard, Skrill, Netelller and Entropay. There are 26 currencies available. The friendly customer service is open seven days a week from 09:00 to 24:00 CET. This ensures that customers will receive answers to their questions via live chat, phone or e-mail. The support is offered in four different languages: English, Swedish, Finnish and Norwegian.